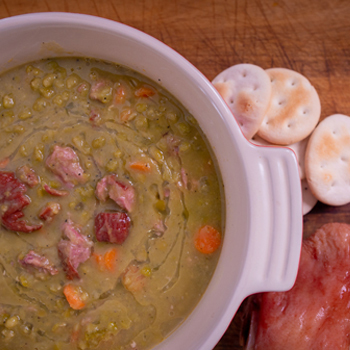 Pea Soup With Hocks – Stahl-Meyer Foods, Inc. In a large saucepan, saute onion, celery and carrots over medium-high heat. Add peas and ham hock and cover with stock by a couple inches. Bring to a simmer and cook about 1 hour until soup is thick and peas have almost disintegrated but not quite. Season, to taste, with salt and pepper. Remove ham hock and let cool. Pull meat from ham hock bone and shred. Garnish with ham and pepper.